Slang term that refers to any Israeli Jew born in the Land of Israel. 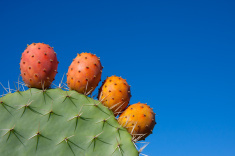 This desert plant, known in English as prickly pear, has a thick skin that conceals a sweet, softer interior. The cactus is compared to Israeli Jews, who are supposedly tough on the outside, but delicate and sweet on the inside.